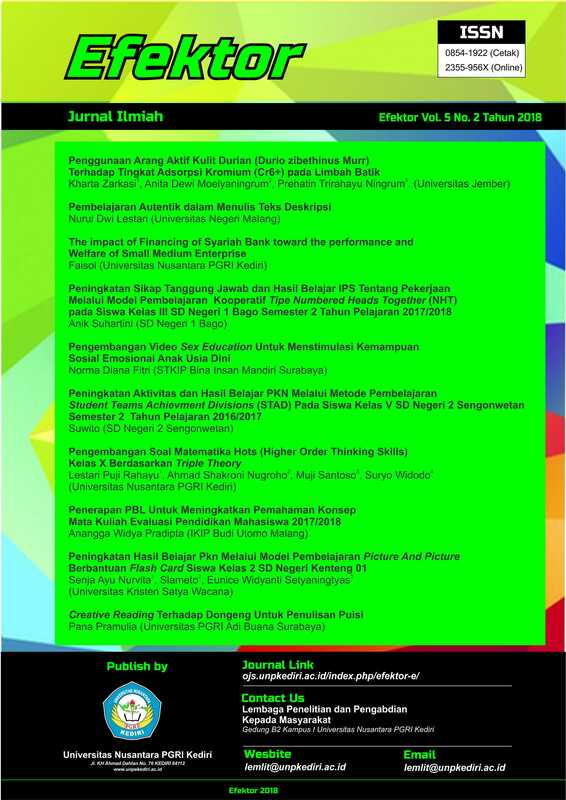 The purpose of this paper is to examine empirically the influence financing of Syariah Bank toward the business performance, the influence of financing of syariah bank toward welfare of small entrepreneurs, and the influence of performance of UKM toward the welfare of small entrepreneurs. The population of this research is all of the small medium enterprises in the District of Kediri who got Islamic bank financing for one year. These samples included 71 SMEs agribusiness. Sampling was done by purposive sampling research, namely SME agribusiness got Islamic bank financing for one year, with a workforce of 5 to 19 people. Questionnaire was used as a tool to collect primary data. The method of analysis used partial least square (PLS). Testing is done with a structural model (Inner model) and models of measurement (Outer model) Statistically, the results show that the Islamic bank financing significant influence with a positive direction on the performance of SMEs, this means that when the Islamic bank financing improved, will improve the performance of SMEs, further financing Islamic banks have a significant effect with positive direction towards the well-being of SMEs so that when the Islamic bank financing improved well-being of SMEs will be increased then the performance of SMEs have significant influence in a positive direction for the welfare of SMEs. So if the business performance of SMEs improved, well-being will increase. Islamic Bank Financing, business performance, welfare, small entrepreneur. Abdillah Willy. Joyiganto. 2015. Partial Least Square (PLS). Alternatif Structural Equation Modeling (SEM) dalam Penelitian Bisnis. Yogyakarta. Penerbit: CV ANDI OFFSET. Chudhury Masadul Alam, Hossain Mohammad Shahadat, and Solaiman, Mohammad, A Well-beingm model of small scale microenterprise development to alleviate poverty. A Case study of Bangladesh Village, International Journal of Sociology and Social Policy, Vol 28 No. 11/12, 2008 pp485-501 Emerald Group Publishing Limited. Fahmi. Irham. 2015. Pengantar Manajemen Keuangan Teori dan Soal Jawab. Bandung. Penerbit Alfabeta. Gronroos, C (1990), Relationship Marketing Logic. Asia Australia Marketing Journal, 4(1), pp 7-19. Ghozali, Imam, 2011, Structural Equation Modeling Metode Alternatif dengan PLS, Edisi 3, Semarang. 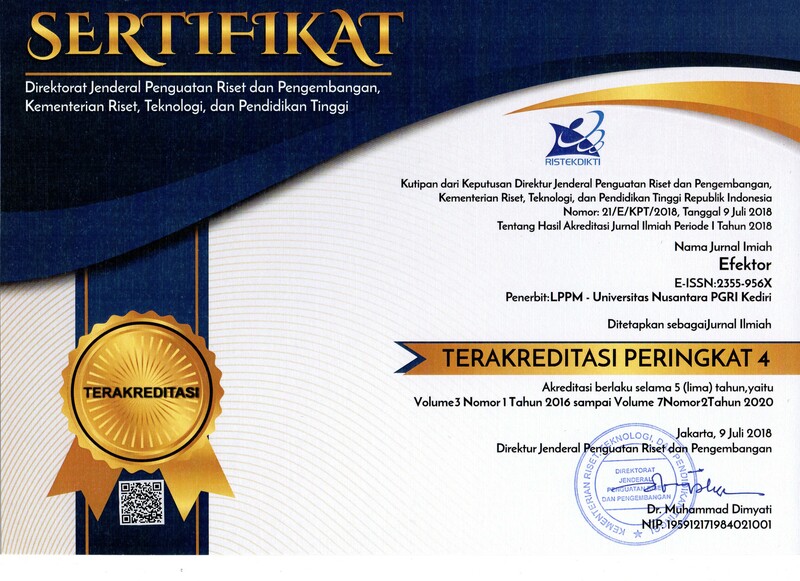 Badan Penerbit Universitas Diponegoro. Pengusaha Kecil Tijarah Zira’ah di Jawa Timur. Disertasi. Program Pascasarjana Universitas Erlangga Suarabaya. Misbah Irwan, dkk.2013 Islamic Banks Service quality and Trust: Study on Islamic Bank in Makassar Indonesia. International Journal of Business and Management; Vol 8, No. 5. Nikmah Choirin, dkk. 2014. Analisis Implikasi Pembiayaan Syariah pada Pedagang Kecil di Pasar Tanjung Jember. Jurnal Ekonomi Bisnis dan Akuntansi, Volume 1 (1): 8-15. Sadono. Sukirno. 2009. Mikroekonomi Teori Pengantar. Jakarta. PT Raja Grafindo. Sutrisno Hadi. (1991) Analisis butir instrumen untuk angket tes, dan Skala nilai dengan BASICA Yogyakarta: Andi Offfset. Sutawi, Pembiayaan Syaariah Pada Usaha Mikro, Kecil, dan Menengah Sektor Agribisnis Dengan Pola Kemitraan. Jurnal Keuangan dan Perbankan, Vol 12.No3 September 2008, hal 147-458. Tambunan, Tulus T.H. Dr., Usaha Kecil dan Menengah di Indonesia, Beberapa Isu Penting, Penerbit Salemba Empat, 2002. Yamin, Sofyan, dan Kurniawan, Heri. 2009. Structural Equation Modeling. Belajar lebih Mudah Teknik Analisis Data Kuesioner dengan Lisrel-PLS. Jakarta. Salemba Infotek. FAISOL, Faisol. The impact of Financing of Syariah Bank toward the performance and Welfare of Small Medium Enterprise. Efektor, [S.l. ], v. 5, n. 2, p. 86-95, june 2018. ISSN 2355-956X. Available at: <http://ojs.unpkediri.ac.id/index.php/efektor-e/article/view/241>. Date accessed: 25 apr. 2019. doi: https://doi.org/10.29407/e.v5i2.241.